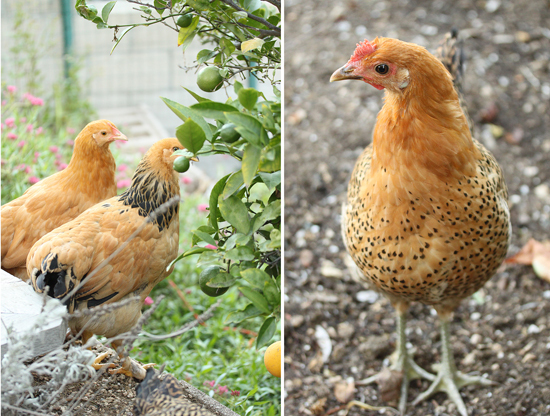 I recently wrote a post about the book Chicken and Egg by Janice Cole and my fascination with keeping chickens. If I lived in a place where that was possible, I would have a whole flock, I think. So when Kim, of Rustic Garden Bistro, invited me to a little blogger get-together to see her beautiful newly remodeled kitchen, I was thrilled, because guess what, she also keeps chickens. Yes! Everyone who was invited brought a little dish to share, and I brought Kalamata Olive and Sun-Dried Tomato on Pesto Toasts. It is an easy little appetizer to transport because you can make the toasts ahead of time, and bring the olive and tomato mixture in a container. 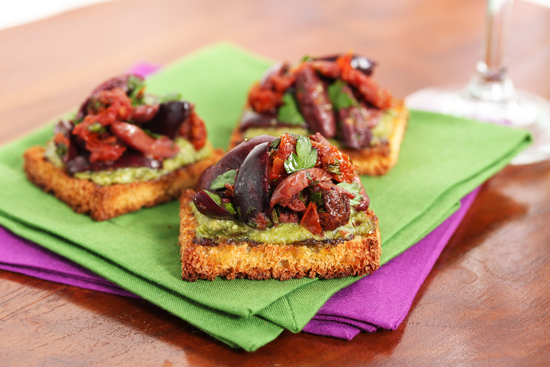 When you arrive you spread a little extra pesto on the toasts before spooning the olive and tomato mixture on top. I like the saltiness of the olives paired with the sweet punch of the sun-dried tomatoes, with the added herby note of the flat leaf parsley. Add that to the basil pesto and you get a perfect flavor combination. In my opinion. If you can’t tell from the photo, the toasts are about 2 inches square. 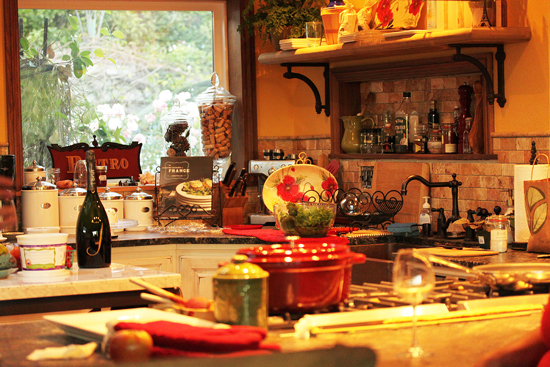 Here is a photo of Kim’s new kitchen. And what a beauty it is. My photo really isn’t doing it justice, but you can see better photos on her blog. She designed it herself and it has everything! Nice work, Kim. These are her beautiful chickens and I spent quite a time watching them. They are so interesting. She also has about twenty new baby chicks that recently were allowed to go into the yard. You can see photos of them here. I photographed my toasts the next day, as I had extra olive and tomato topping. The close-up photos turned out, well… really close up. Sometimes I think my camera is a wizard, the things it can do. Maybe its mother was an electron microscope. Thank you for your patience. 1. Preheat oven to 400 degrees F. Line 2 baking sheets with aluminum foil. 2. 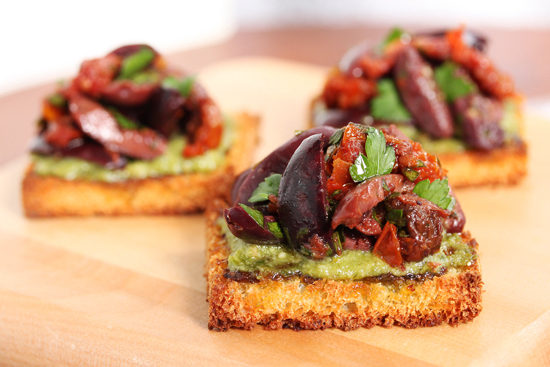 Spread about 1 tablespoon pesto on each slice of bread, then quarter each slice. 3. Toast bread squares on baking sheet until undersides are golden, about 8 minutes. 4. Combine olives and tomatoes in a medium bowl and cover with warm water. Soak about 5 minutes, then drain well and mix in parsley. 5. 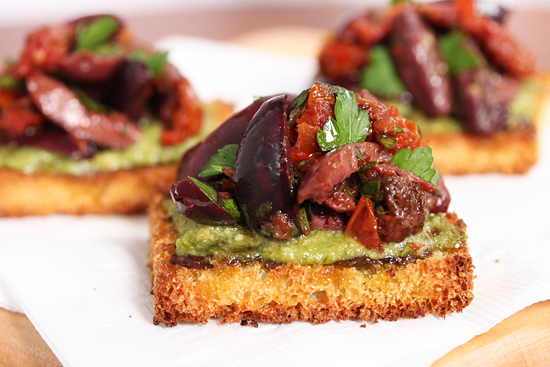 Spread about 1 teaspoon additional pesto on each toast square and mound the olive tomato mixture on top. Serve. Note: There may be pesto and tomato olive mixture left over. Make more toasts for yourself the next day. Enjoy. I love how these toasts look amazing, especially the bread. Wow, add those photos to your impending coffee table book. And they tasted as good as they look! Those are some great looking chickens! Love all of your pictures, and if that’s your kitchen – I want it! Love these toasts! Simple and tasty I’m sure. These were delicious! My husband flipped over them as well (not a small feat when it doesn’t involve meat). Can’t wait to make these for our holiday dinner parties! And it was very nice chatting with you over dinner. Lynne, first – thank you so much for making the drive all the way out to The OC for dinner! Second – thank you bringing this appetizer. They were DELICIOUS. I too love the olives with the sun-dried tomatoes. Genius. Saving this one for my next party. And lastly, thank you again, for the shout-out. Isn’t chicken-watching fun?! You have to come back now, because the little babies are growing up and need someone handy with a camera (you) to photograph them!! There’s a “polish” with a fantastic hair-do. You need to come see him. P.S. Yes, cameras are smarter than us sometimes. That close-up is money.